About — Mark Supik & Co.
Mark Supik & Co is a family-operated business employing ten woodturners and artistic finishers. Our shop is currently located in southeast Baltimore City in the Orangeville Industrial neighborhood. 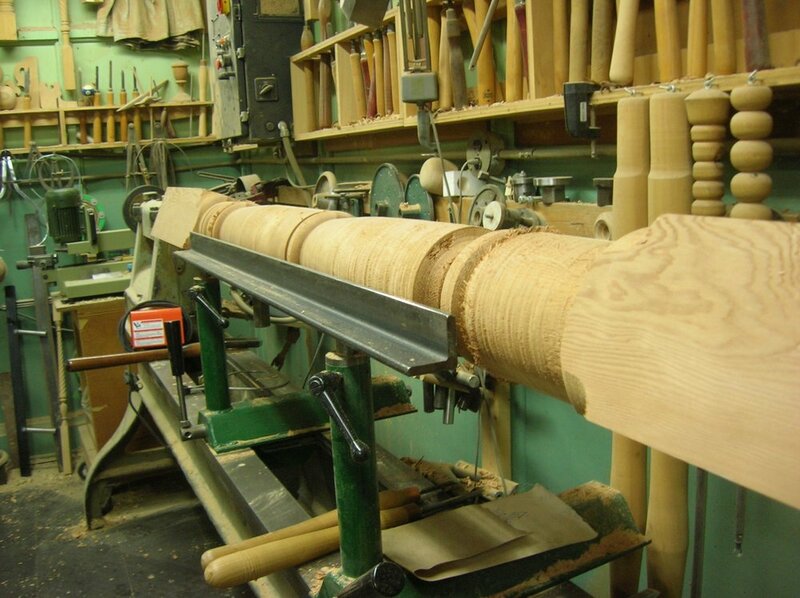 We have been turning wood since 1981, producing custom architectural millwork for historic restorations and wood turned products for furniture makers. In 1995 we began making beer tap handles for the craft brew industry and we now ship those handles all over the country. On the weekends the shop becomes a woodturning school offering all day classes for hobbyists, tradespeople, artists and crafters. Mark first encountered studio woodturning as an undergraduate at the Maryland Institute College of Art studying sculpture. After graduating, he worked for several woodworking business before starting his own shop in one of Baltimore's old industrial neighborhoods. Monday through Friday, Mark directs a staff of woodturners and finishers producing custom architectural millwork, furniture parts, crafted wood products and tap handles for craft brewers. On the weekends, Mark teaches woodturning to beginning and experienced turners. His own turnings of natural edged vessels and sculpted spindle pieces have been displayed in local galleries. Mark is a member of the American Association of Woodturners and of a number of local woodturning clubs. Mark Supik, woodturner, shop manager, workshop instructor. Joe Supik, woodturner, beer tap production manager. Danielle Craven-Slaski, tap handle design & finishing manager. Matt Clark, lathe operator. Matt Saindon, lathe operator. Will Supik, beer tap handle customer service. Cami DiResta & Margaret Eaton, tap handle finisher. Bob Dewey, tap handle production. Ryan Benson, woodworking. Nancy Supik, office manager. A common sight around town, the company truck is a 1953 Chevy 1 ton panel truck, retired in 1983 from the Yoe, PA Fire Department and restored (an ongoing project) by Mark. Mark is a member of the Inliners International Club. In 1981, Mark began buying old woodworking machines and modifying them for production use. His current collection of lathes (mostly rescued from the scrap piles of local schools and industries) includes 7 vintage Olivers, one with a 96" swing, and a 1927 American that will turn a 14' column with a 30" diameter. Our band saw is a 1876 Atlantic. We continue to operate a 1943 Oliver face plate lathe to turn up to 40" diameter curved mouldings. More recent purchase include two high production copy lathes which we use for turning beer tap handles and for high volume spindle copying jobs. 1943 Oliver Face Plate lathe. 40" diameter capacity.